You will need a stockpot tight enough to submerge your duck. Bring Master Stock to the boil and put the whole duck in breast side down. Put on a lid – this is essential to retain the heat when you turn off the heat source. Simmer for 20 minutes then turn off and leave for a further 20 minutes. Take the duck out of the pot, allow to cool and pat dry. Strain the stock and keep for later use. In a large wok or deep fryer, heat up the oil, ensuring there is enough to cover the duck. Cut the duck in half, and if you can, remove the back bone. Carefully place duck in hot oil breast side down and cook for 3–4 minutes until golden brown and crispy. Turn once during frying. Remove from oil and place on paper towels. Use a meat cleaver to chop the duck into smaller pieces. Reduce 2 cups of Master Stock by half. 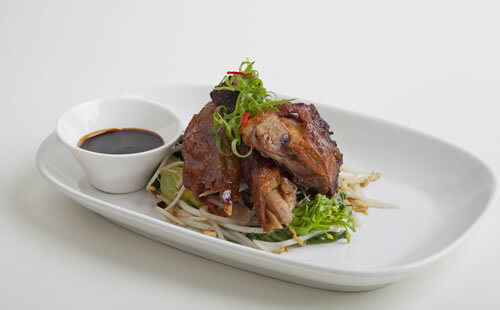 Place crispy duck on top of steamed jasmine rice or noodles and Asian greens. Pour reduced sauce over the duck pieces and accompaniments.